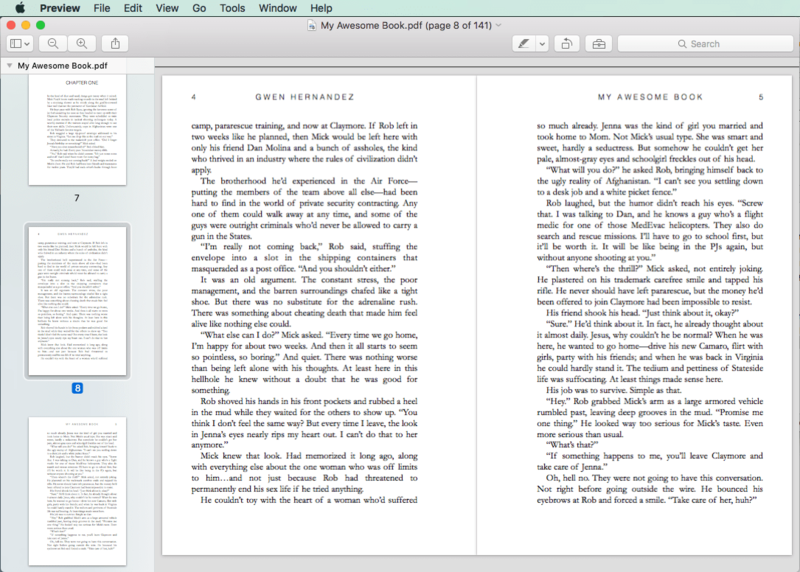 Scrivener 3 for Mac is here! To celebrate, I’ve created a free mini-course to help you transition from Scrivener 2 that covers what’s moved (with a downloadable table of menu commands), what’s changed, and what’s new. In addition, I’ll be rolling out new Scrivener 3 for Mac courses over the next few weeks. I’m going to be taking a slightly different approach this time around, while offering the same style of teaching that you’ve told me you love. I hope you’ll check them out. To make sure you get notified when new classes are live, you can join my newsletter, follow this blog, or check ScrivenerClasses.com from time to time. With Print-on-Demand (POD) services like CreateSpace, Lulu, LightningSource and others, you can make your book available to your readers with no upfront cost to you. Even better, with Scrivener you don’t even have to use Word to do it. You can just set up everything in Compile and create a POD-ready file. If you’re not interested in POD, the following steps still apply to creating a PDF for other purposes. By necessity, this lesson requires some familiarity with the parts of Compile, though I do try to explain as much as possible. It's geared for those who have experience with Compile, but can't quite figure out how to get their PDF to be upload ready. You’ll need to do some reading to determine the formatting requirements for the POD service you’re using. All of them publish guidelines on their websites. For this lesson, we’ll follow the guidelines for printing a 5.25”x8” book for CreateSpace. 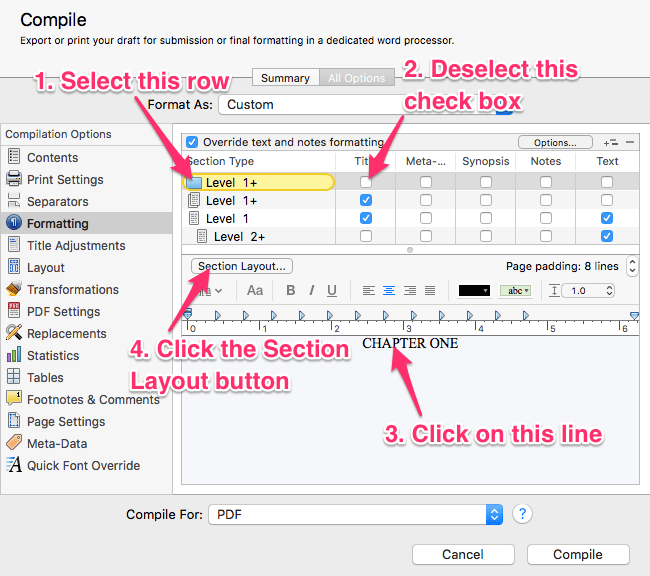 NOTE: This example assumes a project with chapter folders and one or more scene documents within each chapter. You'll have to adjust your settings accordingly if you have your project set up differently. For your PDF, your title page and other front matter may be formatted differently than for an e-book. You may also want them in a different location. 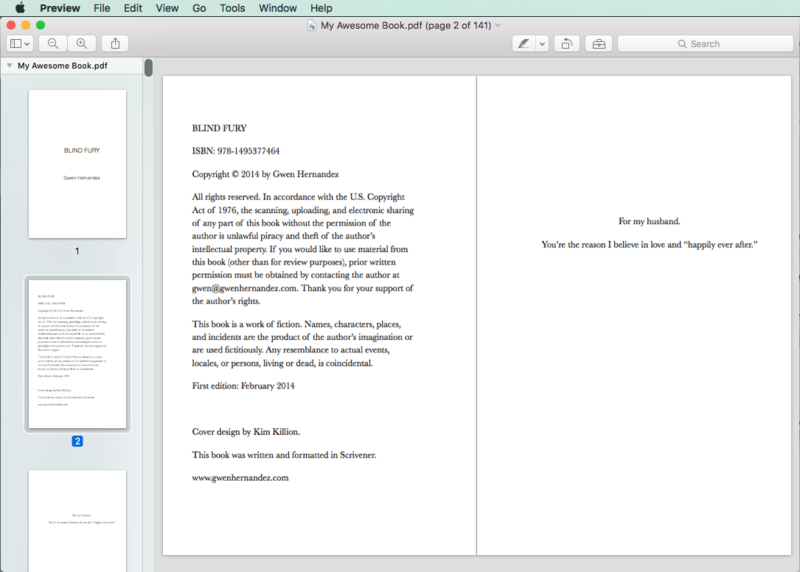 For example, I put my acknowledgments and copyright at the back of an e-book, but the front of a print book. It’s up to you. It’s probably easiest to have two versions of the front matter items with each in its appropriate spot, which you can include/exclude in the Contents tab as desired. For the purposes of this article, I have my front matter in the Draft/Manuscript folder. TIP: For documents with non-standard text and layouts (title page, dedication, copyright, embedded titles of front or back matter items that aren’t marked As-Is in the Contents pane), you might want to preserve the formatting before you compile. To do so, select the text that needs to be preserved in the Editor (before you open Compile), then go to Format—>Formatting—>Preserve Formatting. If you need to force a blank page to get your first chapter to start on a right-hand page, you can insert a text document with only the following at the top of the page: <$BLANK_PAGE>. 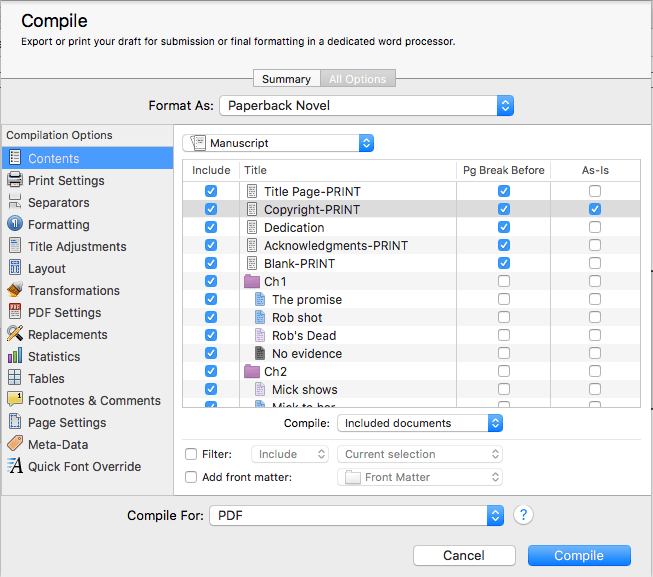 Without that tag, Scrivener will remove the blank page during the compile process. Once your project is ready, go to File—>Compile. From the Format As drop-down, choose Paperback Novel. NOTE: This will change to Custom once you start making adjustments to the settings. Do not change it back to Paperback unless you want to start over (i.e. lose all changes). 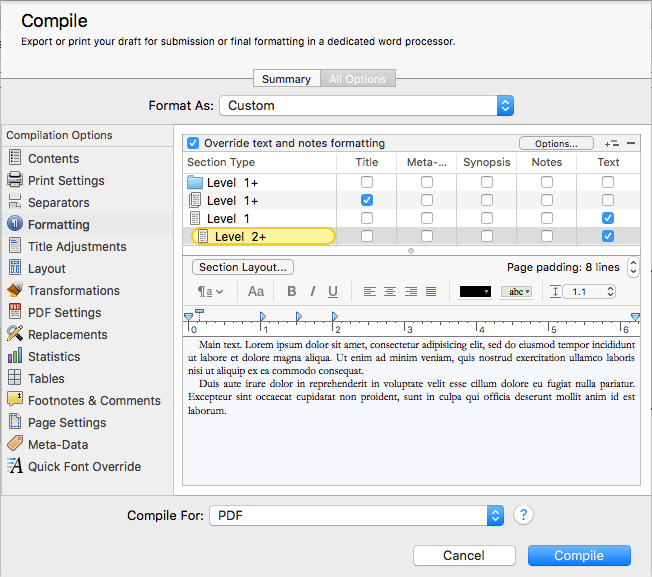 In the Compile For drop-down, choose PDF. Ensure that all desired files are selected for inclusion, have forced page breaks if needed (for exceptions to your Separators rules like front and back matter items), and are set to As-Is if needed (for exceptions to the rules set in Formatting). This tab lets you choose which type of layout to produce when working with PDF files. Choose the Print Settings tab. If you’re not using columns or end-of-page footnotes in your book, choose Publishing. This option gives you more control over layout, and is best for self-publishing. Deselect Color Hyperlinks. Since our POD book won’t be printed in color, there’s no point in coloring them. 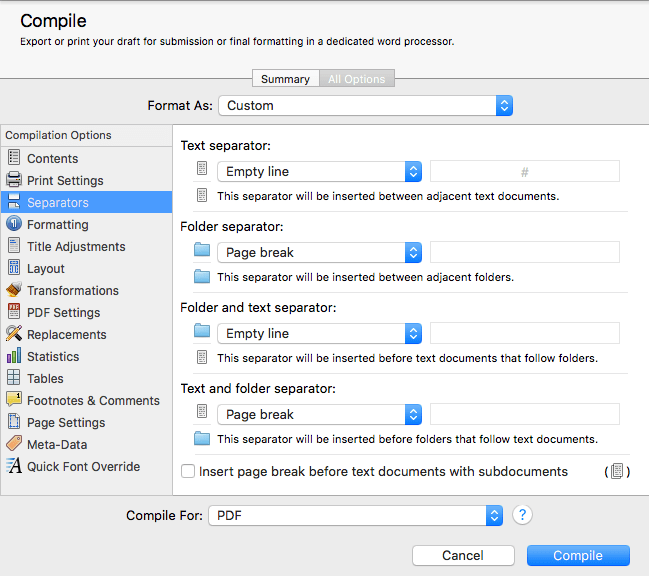 The separators tab is where you set the rules for what Scrivener “prints” as it transitions from one file to the next. Select the Separators tab and make the following selections. This is where we can set the formatting for each type of file at each level within the hierarchy. We can adjust the settings for chapter auto-numbers, titles, and text. Select folder Level 1+ (row 1). This applies to our chapter folders. Click the “Aa” button to view the Fonts window. Choose your desired fonts. For mine, I’m using Helvetica, Light, 18. Close the Fonts window. Click the Section Layout button. Under the Title Appearance tab, ensure the Title Prefix is set to Uppercase (or whatever case you prefer for your chapter auto-numbering). Click OK.
Leave the Page Padding (far right, center) at 8 lines. This will force Scrivener to start printing the chapter number about 1/3 of the way down the page. Deselect the Title checkbox. NOTE: Marking a document As-Is on the Contents tab also prevents Scrivener from printing titles. For front and back matter documents that are marked As-Is, and for which I wanted a title, I typed the titles directly into the document in the Editor and preserved their format. Click on the block of text in the Format Editor, then click the “Aa” button to get the Fonts window. Choose your desired font and size. I’m using Garamond, 11. Close the Fonts window. If necessary, change the line spacing and space after paragraphs (available under the Line Spacing dropdown by choosing Other). I left mine as single spaced with no space after the paragraphs. With the third row still selected, press Command+C on your keyboard to copy the settings of this row. Select the text Level 2+ row (last row) to allow for changes to our scene documents. Press Command+V to paste the previous row’s settings onto this row. This saves us some time when two rows need to be similarly formatted. Layout: I suggest you leave the Layout pane as it is. It’s good to have a * * * inserted when a scene break falls on a page break to avoid confusion. Transformations: You shouldn’t need to make any changes to the Transformations pane unless you need to remove highlighting, text color, or hyperlinks. PDF Settings: Leave as is. The Generate PDF Outline doesn’t really apply to POD. It just allows a PDF viewer to have an outline of the document. Footnotes & Comments: All should be as needed unless you’re using footnotes. We mainly just want to ensure comments and annotations are removed (so readers can't see our notes to ourselves). 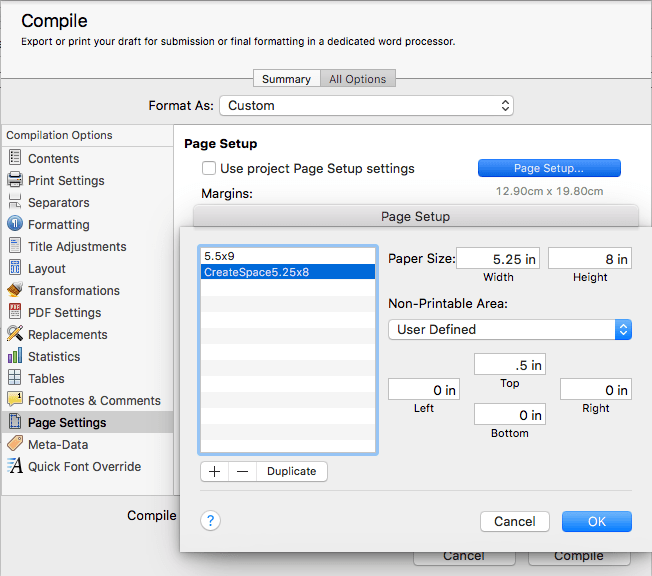 This is where you set up the correct paper size, header space, and margins for you document. Read the publisher guidelines carefully to determine what you need. Select the Page Settings tab. Click the Page Setup button in the upper right corner. In the window that opens, click the Paper Size drop-down and choose Manage Custom Sizes. 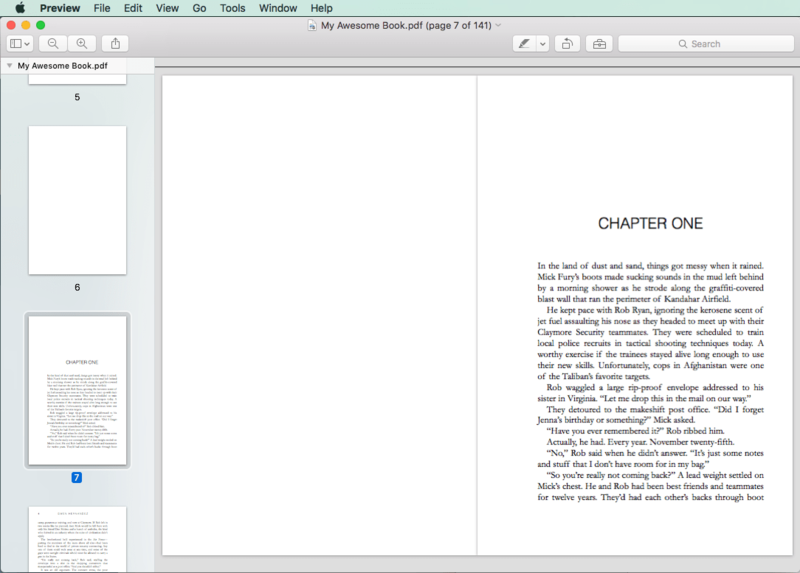 Click the [+] button at the bottom to create a new custom paper size and name it CreateSpace5.25×8 (as shown below). Set the paper size to a width of 5.25 and a height of 8 inches (see image above). These are the outside dimensions of the book. Under Non-Printable Area, choose User Defined, if necessary. As shown in the image above, make the Top .5 inches and the rest zero. 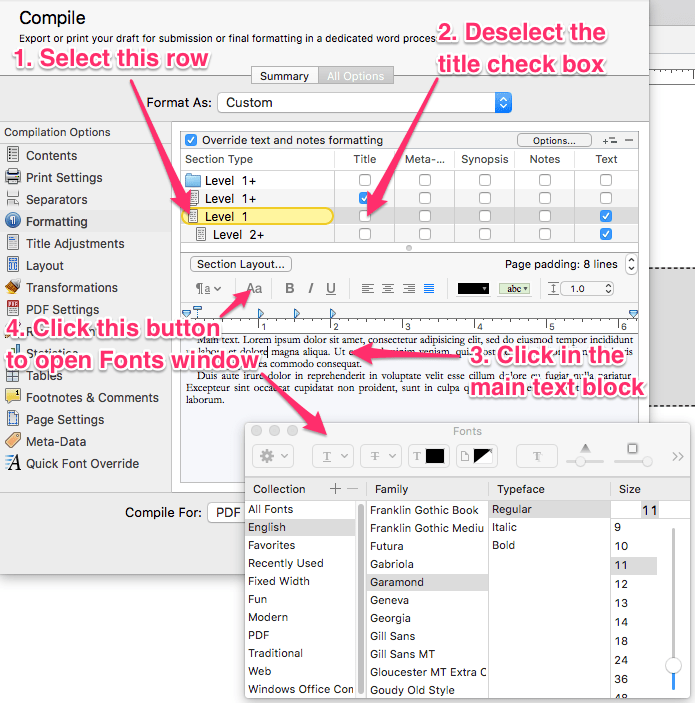 Click OK to close the Custom Paper Sizes window, and click OK again to close the Page Setup window. In the future, you'll be able to choose your custom page size and won't have to create it again when making a PDF for the same size book. How you set up the headers and footers is up to you. 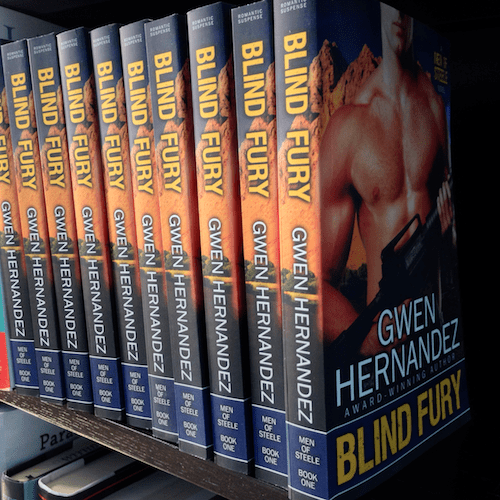 I’m walking you through what I did for Blind Fury and Blind Ambition. I based these settings on a major publisher’s book with a layout that I liked. Still on the Page Settings tab, click the Header and Footer button at the center. In the center header box, remove the placeholder tag and type the book title. I did mine in all caps with an extra space between each letter, and two or three between each word: M Y A W E S O M E B O O K.
In the right header text box, type: <$p> (remember, we’re setting this up for the right-hand page; we’ll set up the left-hand page in a minute). Remove the <$p> from the center footer box. Ensure that the two checkboxes are selected. The first one suppresses the header on the first page and all new pages (front and back matter items and chapter first pages). The second option won’t print a header on any single page (most front and back matter items, as well as any documents short enough to encompass a single page). Change the Header font, in the text box at the bottom, to Helvetica, Light, 9. Your Page Settings pane should look similar to the one below. I didn't change the footer font because I don't have any footers. Obviously, if you do, you'll want to change that too. Click the First Pages button at the center. This section lets us set up a different header/footer for the front and back matter. In our case, we don’t want any headers or footers to show until the second page of chapter one. 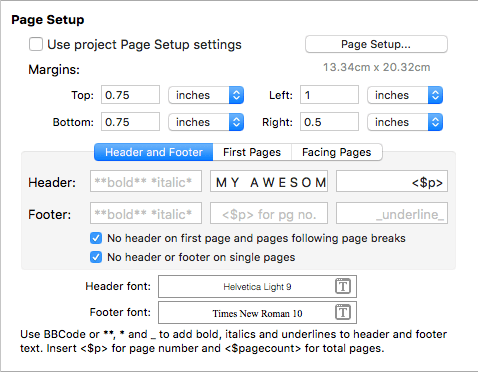 To do that, ensure that the Different First Pages Header/Footer checkbox is selected. Click the Start Regular Header and Footer On drop-down and choose a number that will get you to the first page of chapter one. Since I have five front matter items, I’m choosing Page 6. If any of your front matter items are longer than one page, you’ll have to adjust accordingly. NOTE: The reason we want to start this on the first page of chapter one is so that the numbering is correct. Remember that we already suppressed headers for pages following page breaks, so the header won’t actually print on that first page, but the computer will start counting pages there. Ensure that all of the text boxes in this section are empty, as shown below. Click the Facing Pages button at the center of the Page Settings pane. This section is where we turn on and set up the left-hand (i.e. verso) pages of our book. If it’s not already, check the box to Use Facing Pages. In the center header box, remove the placeholder tag and type the author name. I’m using all caps with an extra space between each letter, and two or three between each word: G W E N H E R N A N D E Z. In the left header text box, type: <$p>. Delete any text from the other text boxes in the verso (left-hand) header/footer section. Your Page Settings pane should appear as in the image below. NOTE: Verso means left-hand. Right-hand pages are called recto pages. You may see this in some documentation. Whew! We’re ready now. You can add/change any of the items in the Meta-Data tab, but it’s not necessary. Also, we’re not using the Quick Font Override in this instance because we’re using different fonts for the headers and the book text. In the Save As text box, type the title of your book (taking care not to delete the .pdf extension). I used My Awesome Book.pdf. Here’s where we get to check it for issues. Locate your PDF file and open it in Preview (this should be the default unless you have different Adobe PDF viewer or creator, which is fine). Here's what mine looks like in Two Page view. NOTE: Depending on how you view it, the margins and headers may appear incorrect, but remember that we’ve set it up so that the bound side of the page has an extra .5” margin, so everything will look a bit off center. Also, when you upload the file to create your book, the first page (title page) will be on the right, but in preview it may appear on the left (mine usually displays on its own page). Another thing to notice is that Preview has set the page size to match the 5.25×8 settings. If you print this on letter-size paper, there will be a lot more white space around it. This preview is how the book pages would look before binding. If everything looks good, you’re ready to upload! Good luck creating your PDF! Need more help? Sign up for an online class, read more Scrivener articles, or schedule a private training session. Fall Scrivener online courses – Register now! As promised, registration is now open for the fall round of Scrivener online courses. Sign up today! For more information and registration, check out the Scrivener Courses page. Fall is coming soon, which means it's time for another Scrivener course (or two). Based on student feedback, I've decided to make some changes.1. I am splitting my original four-week, everything-but-the-kitchen-sink course into two different classes. That means less time commitment per course, and less money to spend if you're not ready to move into–or only need–intermediate and advanced concepts. 2. We're getting a new classroom environment, one that I hope will provide some of the benefits of the previous platform, but without the technical problems. The new classroom is set up like a web forum. Not as pretty, but it allows for organizing Q&A by topic, and makes the content searchable. A big plus for those who can't remember where they saw a post. To learn more–and/or to register–keep reading! Or, for more detailed information on all of my upcoming courses, visit the course page on my website. Want to be the first to know when my next course opens? Join my newsletter. This class will teach you how to customize your Scrivener projects for the way you write. You’ll also learn simple but powerful tools for organizing, visualizing, revising, and sharing your work. This workshop is for anyone with a beginning to intermediate level of experience with Scrivener. Prerequisites: Download/install Scrivener on your computer (the free trial is fine). Format: The course is conducted in a virtual classroom, which allows me to post daily lessons in DOC and PDF for students to download, and provides a forum for asking/answering questions. The course also includes a weekly video screencast where I answer student questions through an on-screen demonstration. Price: $25This course will take your Scrivener knowledge to the next level. It's intended for those who already have a solid foundation in Scrivener. Prerequisites: Scrivener I, or a good understanding of the topics covered in Scrivener I (see course description above), and Scrivener installed on your computer. Registration for the September Scrivener for Mac and Scrivener for Windows classes is now open! Click here for more information. If you're ready to sign up, click here.